Threadless, Chicago’s beloved international online community-based design platform, has partnered with four comic artist icons to create its fourth series of the Comics-On Tees line. With artwork by Mike Allred, Colleen Coover, Chris Samnee and Francesco Francavilla, this new t-shirt series depicts a storyline written by Chris Roberson and will be available for purchase individually or as a set exclusively at Threadless.com. Comics-On Tees only started in 2010, but has been a big hit with comic fans and short-sleeved shirt aficionados everywhere. 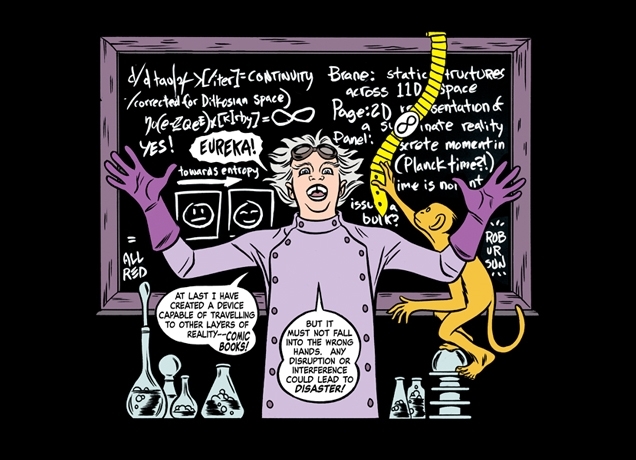 Volume 4 is entitled 'Monkey Around' and features mad scientist, romance comic, monkey superhero, and monster comic themed shirts. Personally, I'm pretty pumped for the Allred 'issue', but they all sound pretty cool. Apparently, I'm not the only one up for the fourth set of books/shirts as series 4 writer Chris Robertson is itchin' to add them to his own collection. "Years ago when I first discovered Threadless, and since then, easily half of my wardrobe at any given moment is made up of Threadless tees,” said Chris Roberson, iconic comic book author. “And when the first Comics-On Tees line was released in 2010, I bought every one and wore them to pieces. This year when I was approached by Threadless to do my own line of Comics-On Tees, I couldn’t possibly refuse! Now, I just can't wait to wear them!" They retail for $24 each or $79 for the set of four- pick 'em up here.